You can use spool knitted cords to decorate and embellish your crochet in a million different ways. One way to do a thicker spool knitted or i cord is to use several strands of yarn held together. And, if you don’t have a spool knitter, not to worry! You have your fingers! 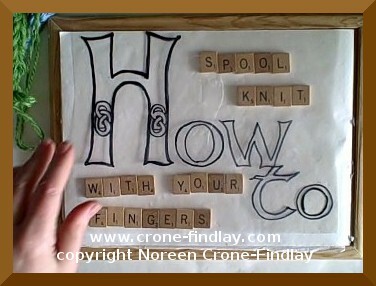 I have made a video tutorial on how to make a spool knitted cord on just 3 of your fingers. How’s that for a portable creative project? Brilliant! This is so clever and a great project for kids! Thank you Aleksa! And, the best part is, that you can do such neat things with the cord after you’ve made it 😀 And… like you said… soooooo portable!!!!! On an airplane? Ask for a swizzle stick, and you can spool knit for the entire trip, and not have to worry about the security people taking your tools away!